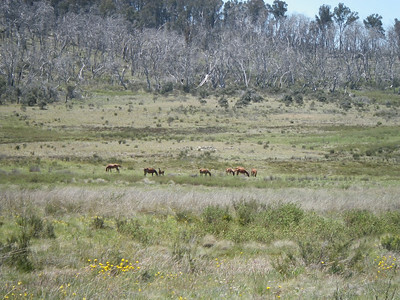 This year's ACT championships will be held in the beautiful high country of the northern Snowy Mountains. It is an area that was explored for the 2010 Australian Champs, but at that time had been recently burnt and was unsuitable. Now it is in perfect condition. There is a mix of open grassy plains, grassy woodland and some alpine forest. Very little scrub and lots of wildlife including kangaroos, wombats, lots of birds and lots of brumbies - you'll probably see some just driving to the HH! The course is set by David Baldwin and Julie Quinn, and includes something for everyone. Lots of easy options for families, and plenty to keep even the top teams busy! The course ranges from 1250m to 1600m with fantastic views. A subsidised bus is available on Friday evening to the event - please enter early to ensure you get a seat.